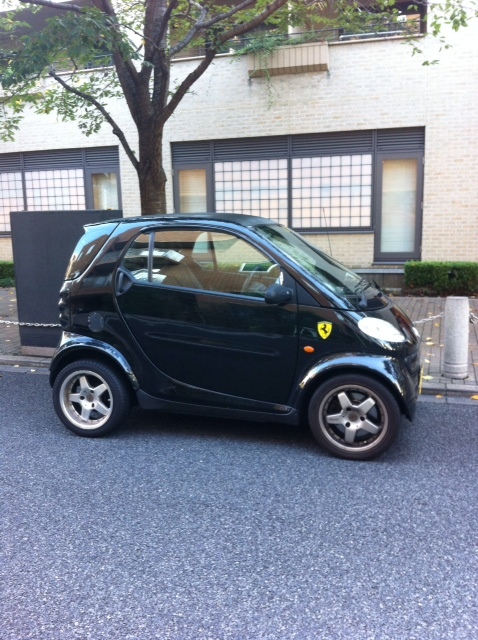 Holy Smart Cars – it’s a Ferrari! When my husband first saw this photo, he thought it was just a regular Smart Car with a Ferrari sticker on it. But oh ye of little faith, I checked in with my “friend” Google and found out that yes, Ferrari has been making a smart car. At first it was just Ferrari designers working for Smart Car, but then the company, in 2008 or thereabouts, starting their own line of them. Here’s a link to a Ferrari dealership in the US that carries the car, Dessert Motors. I went on Smart Car Owner fora and also looked at some interesting design options for the car. Tokyo is a car-lover’s dream – you can find every conceivable type of car around here, from a tiny Toyota to a huge Hummer. Japanese people love new cars, but most of them are pretty practical, and the city exists mostly on the infrastructure of the public transport. But still, it’s fun to see what people drive around every day, and every now and then, you find something astounding. Enjoy! 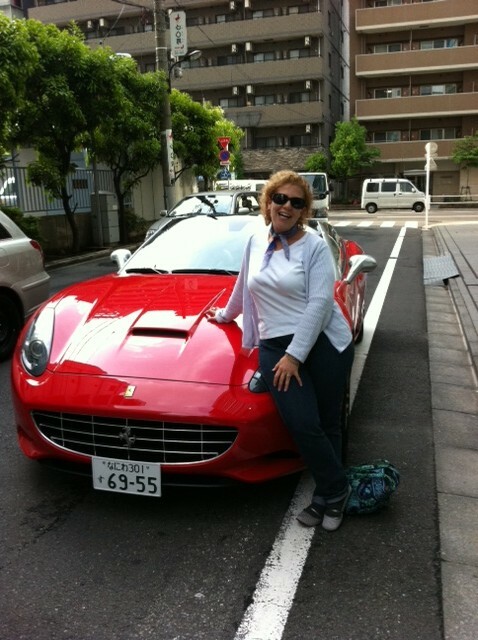 The Tokyo American Club is offering any of their member who wants to, a test drive of a Ferrari. Done in concert with the local Ferrari dealership, all you have to do is make a reservation. My husband, Marc, is a real car guy and couldn’t resist taking the opportunity. We originally had a morning appointment, but the morning in question was very rainy. Luckily, they had a 4pm appointment open. Who really wants to drive a Ferrari in the rain? When we arrived, we were guided toward a seat in the showroom and given iced tea or iced coffee by a lovely, young Japanese woman. The man who would help us, Kawazoe-san, came out to greet us and in traditional Japanese form, bowed and exchanged business cards with Marc. He then asked Marc to sign a waiver. Note that he never, not once, asked to see Marc’s driver’s license. It took a few minutes for them to process the paperwork and get the car “ready” – whatever that meant. 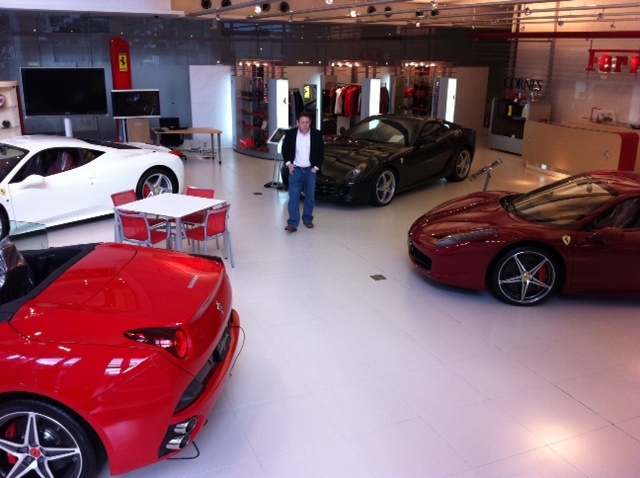 But it gave Marc and me a few minutes to look around the showroom, which had five cars in it. Marc knew the horsepower, torque, engine size and capacity of each one. I just knew that they were cute – and red. Finally it was time to go see the cars. In the sunlight, the California sparkled. It was red – like candy apple red. Marc took in his breath with excitement. Kawazoe-san showed him some of the finer points of the car and gave him pointers on driving. He then squeezed himself into the tiny back seat so I could sit shotgun. Kawazoe-san had a route in mind for Marc, which took him essentially under the Rainbow Bridge and into Daiba, where the streets are wider and less crowded so Marc could really open it up and feel the car. There’s only one word in my vocabulary for the experience: exhilarating. We had the top down and cruised through town like we hadn’t a care in the world. The whole thing lasted perhaps twenty-five or thirty minutes, but it was a week’s worth of fun all compacted. 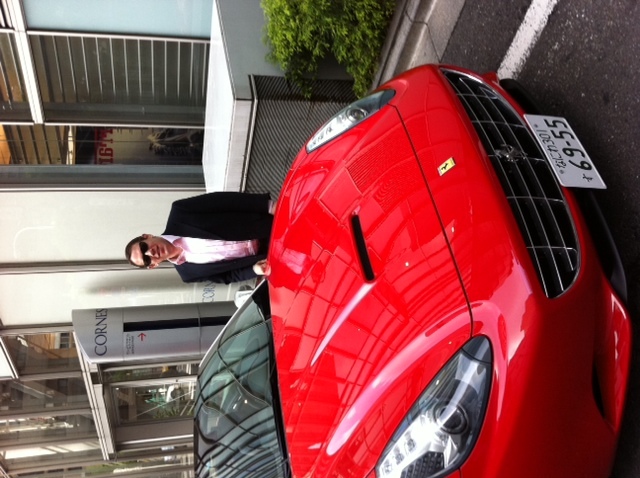 When we got back to the dealership, Marc traded cars to the 458. I could not ride along on that once since it is a two-seater. I took a few photos of him with the car, but then went on my way. Marc says that the most amazing part for him was hitting sixty miles per hour or so and then putting the pedal to the floor and getting pushed back in the seat as the RPMs hit 8000. He keeps talking about the BBC “Top Gear” guy who shouts out “what a machine!” with great glee during his test drive. I think if Marc wasn’t self conscious, he might have done the same! All in all, it was a great experience – a heady one – and one we won’t soon forget. It was a great Tokyo moment.